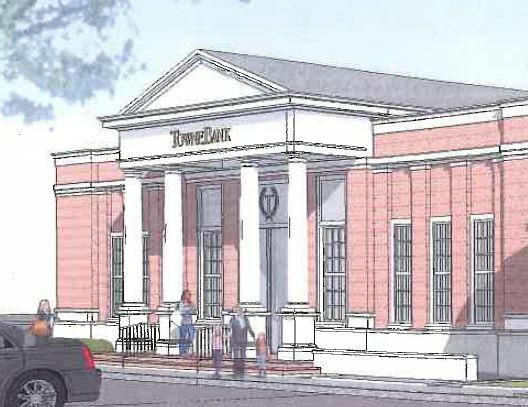 TowneBank Wards Corner design. Construction is expected to begin in August. Concerns were expressed at the last couple of Wards Corner Taskforce meetings about the sidewalks along Granby Street and E. Little Creek Road surrounding the new Harris Teeter Shopping Center being developed by Suburban Asset Management. The sidewalks, in the past, were abutted up to the street and seen as a safety and aesthetic issue. The preference was to push them a couple of feet back from the street to allow for a grass verge. 1-Granby Street – there will be a 5 ft sidewalk and a 5 to 6 ft grass verge between the sidewalk and the curb. 2-Little Creek – sidewalk will be 6 ft wide. There will not be a grass verge due to the tight space and the preference for landscaping behind the sidewalk. Dominion Virginia Power will be removing and replacing the sidewalks as a part of their efforts in burying the power lines in the area. Council Members Barclay Winn, Andy Protogyrou, and Terry Whibley, and Mayor Paul Fraim were present. Mr. Wynter Benda was introduced as the new Assistant City Manager who has been assigned to the Wards Corner area. Mr. Benda can be reached at 757-664-4263. Talbot Hall is up for sale by the Episcopal Diocese of Southern Virginia for $4.25 million. Harvey Lindsay is the listing agent. The private non-profit organization, Talbot Hall Foundation, is working with the Diocese and Harvey Lindsay to raise funds to purchase the property for permanent protection. The Foundation hopes to raise funds through a public/private partnership using grants and donations. It also envisions establishing an endowment to maintain the property using historic and environmental easements that would be sold for tax credits. The Foundation hopes the City will contribute towards the preservation of these 8 acres of waterfront property on the Lafayette River and plans to make a presentation to City Council regarding its proposal. Task Force members agreed to discuss at the next meeting (September) as to whether the City should dedicate any of the Wards Corner funding towards the acquisition and protection of Talbot Hall. Tidewater Drive Infrastructure Improvement Projects are getting underway along the section between East Little Creek Road and Roland Park. A handout was provided with the various types of improvements and timelines, which are scheduled to continue through the winter of 2015. For more detailed information, go to www.norfolk.gov and type in the keyword: Tidewater Projects. Virginia Natural Gas continues to replace sections of its underground lines in the City as part of its statewide program to ensure the reliability and safety of its pipelines. VNG works closely with the Department of Utilities on these projects. The Granby Street Project is nearing completion. Three upcoming pipeline replacement projects in the vicinity include the East Little Creek I Project, the West Little Creek II Street Project, and the Louisiana Drive Project. The City provided a handout that explains the VNG program and local projects. This information can be found at the City’s website at www.norfolk.gov using the keyword: VNG. Utilities – Sewer line replacement projects continue in the area and are close to being finished. Utilities will soon be starting on the replacement of a 20” water main along the Norfolk Southern railroad tracks adjacent to I-564. Norfolk Southern has constructed a new siding along the area. City Council representatives requested more information about this rail siding at the September meeting. Concern was expressed about impacts to the neighborhood to the south of the railroad siding. Suburban Park Shopping Center Update – The City will be starting on the road changes at Granby Street and Louisiana Drive, which will include a traffic signal and turn lanes. The HRT bus stop will be removed. The road construction, along with gas line replacement work by Virginia Natural Gas, and undergrounding of the power lines by Virginia Power, will be timed to be completed for the opening of the shopping center in 2014. Construction has started on the Harris Teeter portion and will soon start on the rest of the buildings. The issue of the sidewalk right-of-way along Little Creek Road was discussed again. Suburban Asset Management has agreed to talk with the City about moving the sidewalk away from the road for pedestrian safety. SAM’s landscaping plan is currently under review by the City. A question was raised as to whether the former audio-visual crosswalk system between the north and south side of Little Creek road will be replaced. The City said there is not currently funding in the Utilities program for its replacement, but that residents can request it for possible future funding. Dollar Tree has leased and started renovations on the site of the former China Buffet. Since Wards Corner was the site of Dollar Tree’s first store, the company plans to make this new store their flagship. The City is still talking with the owners of the Farm Fresh property about the demolition and redevelopment of the old building beside the store. The property is up for sale but is not being marketed. The City hopes that a small shopping strip or restaurant could go in this site, which fronts on Admiral Taussig Boulevard. It was mentioned that lighting of the Farm Fresh parking lot needs to be improved since some people are hesitant to shop there at night. The parking lot also floods in some areas and needs repaving. Sentara has lease the former ATC Fitness site on the southeast corner of Wards Corner and plans to develop an urgent care facility. The Denby Park/Cottage Row/Oakdale Farms community will be the site of the August 6, 2013 Night Out event in Norfolk. The theme will be “Growing a Better Community.” The civic league is looking for volunteers and sponsors. Those interested in helping should contact LaCrystal Locks at 757-348-6739 or RJ Luce at 757-404-8072. July 17-19, 2013 eXcel, a 3-day youth leadership program of LEAD Hampton Roads and the Hampton Roads Chamber of Commerce, that prepares youth for leadership positions within the community and region. September 19-20, 2013 14th Annual Virginia Statewide Neighborhood Conference, Virginia Beach Resort Hotel & Conference Center. VSNC offers a special youth track of workshops focusing on community development, organization, and advocacy. Civics Comes Home to Norfolk, August 6 & one other date TBA. The Suburban Acres Civic League will offer two activities during the summer focusing on local community groups and their interaction with local government and business. Michelle Washington, of the Virginian-Pilot, wrote an article about the wait for improvements to Waterside and Wards Corner. You can read the entire article here. Across town from Waterside, another neglected duckling also waits for its transformation. A $1.2 million renovation of the Midtown Shopping Center in Wards Corner has been completed for months. Gleaming white stucco hid drab brown corrugation; a bold new sign proudly announces WARDS CORNER to passersby. Fresh white paper went up in the windows, along with new signs that advertise retail space for lease. Across the street, at the former Suburban Park shopping center, walls have begun to rise for a new Harris Teeter grocery store. Its opening is months away, but all but one of the center’s retail spaces has been leased. Yet the Midtown Plaza, owned by Joan Dalis, continues to harbor empty storefronts behind that fresh exterior. Negotiations with Dollar Tree – a national chain founded in Norfolk that opened its first store in Suburban Park shopping center – to occupy space in Midtown fell through. Dollar Tree plans to move into the former # 1 Chinese Buffet restaurant in the center on the northwest corner, which also contains AutoZone and Pancake House. AJ Gators, which enjoyed a prime Wards Corner location until it was razed for the Harris Teeter, has not been able to find a new site nearby. Dalis put me off three times when I called to ask why those shops remain empty. Folks in Wards Corner have begun to despair that, once again, they have been fooled into thinking their neighborhood stood on the verge of a rebound. It’s hard to imagine that empty space fits that definition, for Dalis or for anyone. Councilman Andy Protogyrou let his frustration with Dalis show. “She put lipstick on a pig, but if she would actually rent the property she would turn it into a peacock,” he said. Norfolk waits, no longer patiently, for Wards Corner and Waterside to get the rest of that makeup on and come to the dance. On Thursday, June 13, from 4 to 6pm, there will be an open house at Talbot Hall. As you may have heard, Talbot Hall has been put up for sale by its owner, the Episcopal Diocese of Southern Virginia. Harvey Lindsay Commercial Real Estate, which is handling the sale, is holding this open house as a courtesy to the Talbot Park neighborhood. Talbot Hall, at the end of Talbot Hall Road, is a 200 year old plantation house located on 8 acres overlooking the Lafayette River. The Talbot Hall Foundation is making every effort to protect and preserve Talbot Hall for the use of future generations. You can show your support for that effort by attending the open house. Dollar Tree will be returning to Wards Corner in the near future. Dollar Tree’s roots are in Wards Corner where store #1 was located. The Wards Corner Dollar tree closed last year to make way for the new Harris Teeter anchored shopping center that is currently under construction. The new location will be at 7635 Granby St which is the location of the recently closed No. 1 Chinese Buffet. The lease has been signed and both interior and exterior improvement are expected. A new facade is expected as well. A mid-late summer opening is expected. You are currently browsing the Wards Corner Now - Wards Corner, Norfolk, Virginia blog archives for June, 2013.